Santa Fe Community College. Veterans and Family Appreciation Day: Veterans Resource and Career Fair, Thursday, Nov. 8. 2 to 5 p.m. A fair with information on new benefits and programs for vets, veteran-owned business support, education benefits and veterans’ family services. 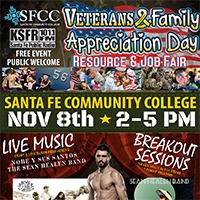 Live music (Nohe Y Sus Santos from 3:30 to 4 p.m. and The Sean Healen Band from 4:20 to 5 p.m.), veteran-focused breakout info session and a guest appearance of New Mexico’s Mixed Martial Arts Fighter Carlos Condit from 4 to 4 15 p.m. are new additions to the annual event. Free event. Sponsored by SFCC and KSFR 101.1FM. SFCC, Jemez Rooms, 6401 Richards Ave. Call 428-1305 for information.